These were so quick and easy to make and I could not be happier with the results. I picked up this wool a while back with nothing particular in mind, I just loved the colours. The styrofoam tree shapes are available just about anywhere at this time of year. These came from a $2 shop. However, there’s no reason you couldn’t just make a cone shape from cardboard and achieve similar results. I tied a tight knot in one end to stop fraying, then pushed through the wool and down into the middle of the cone. Then gently began wrapping the knit around the top of the cone, before fastening again a few rows down so that it doesn’t spin off. Continue down the full length of the cone until you reach the bottom. Cut with enough room left over to tie another knot, then secure with a 3rd pin. Done! 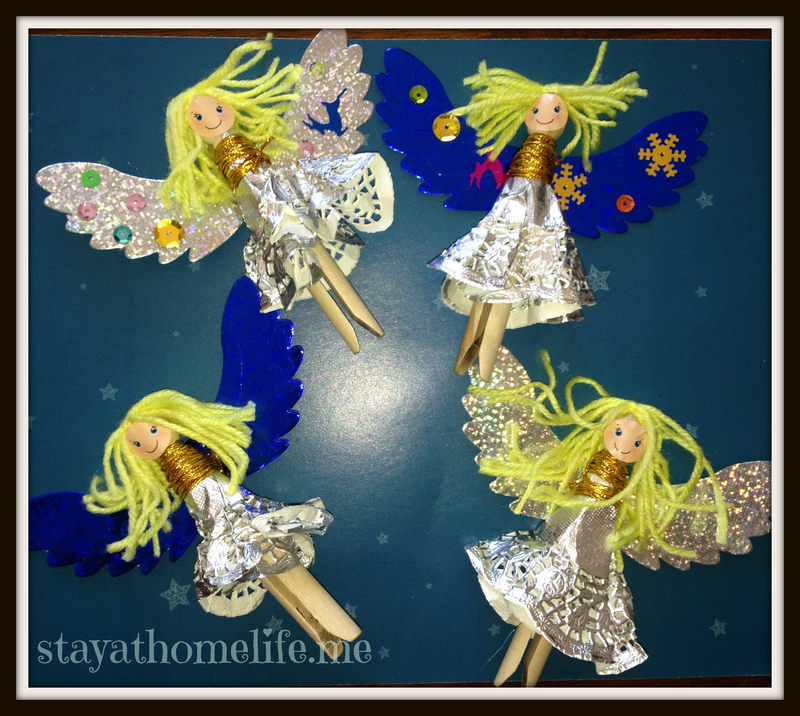 Check out these cute little Christmas Angels Miss4 and I put to gather today. The best part? The whole kit, with everything except glue – $2 from Kmart. Win. Ok ok, they have no arms, but who cares! We used hot glue to stick on the hair and faces, because hot glue rules the craft world (and I didn’t have time to PVA to dry). The project is not something Miss4 could have done on her own, but it was quick, simple fun and the results are pretty cute. She has been playing with them throughout the day and they have not fallen apart yet! If you didn’t have access to a Kmart, the kit is made up of 4 old style wooden pegs, 4 paper doilies, wool, gold string and some pre cut wings. All things that are easy to get your hands on from a craft of $2 shop. 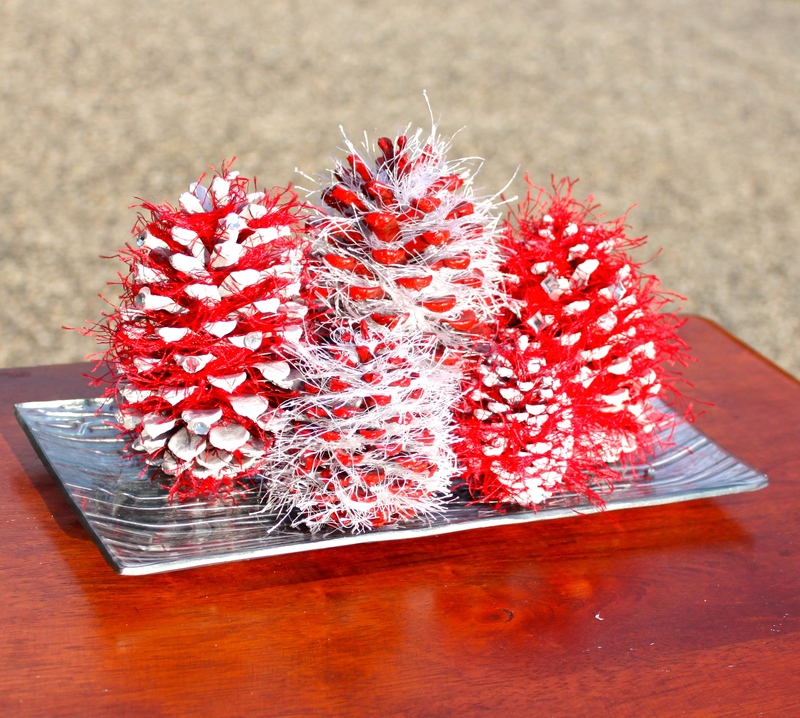 Everyone was making all sorts of cool glass baubles last Christmas, but by the time I tried to source the actual baubles to do anything with, they were sold our or $6 each – errr, nah. But I found some in Spotlight in August this year and grabbed them so I didn’t miss out again! I got the 2 different sizes available at spotlight, but for this project we just used the smaller ones. The process really is so simple it barely requires explanation. The beads are just plastic pony beads, you can find them in either the craft section or the ‘girls’ toy section of most variety stores. The ones that turned out the best were about 2/3 transparent beads and 1/3 solid colours. We did one with just transparent beads, but it ended up all kind of mixing together and turning brown, which was disappointing. If you don’t have a well ventilated kitchen, it would be a good idea to do these outside on the bbq, but the beads surprisingly don’t let off much fumes compared to other melting plastics I have played with. I had the oven set to just over 220c. You will need to keep checking on them every 5 – 10 minutes and turning as desired to create the marble effect. We used a silicone muffin and chocolate tray to position them after each turn and plastic tongs to handle them with. I ended up adding some extra beads to a few half way through the process, and just used a tea towel to hold them while they were hot. As they cooled down out of the oven, they did make a popping sound, which I thought was the glass breaking – but it was just the plastic separating from the glass inside a few of them. 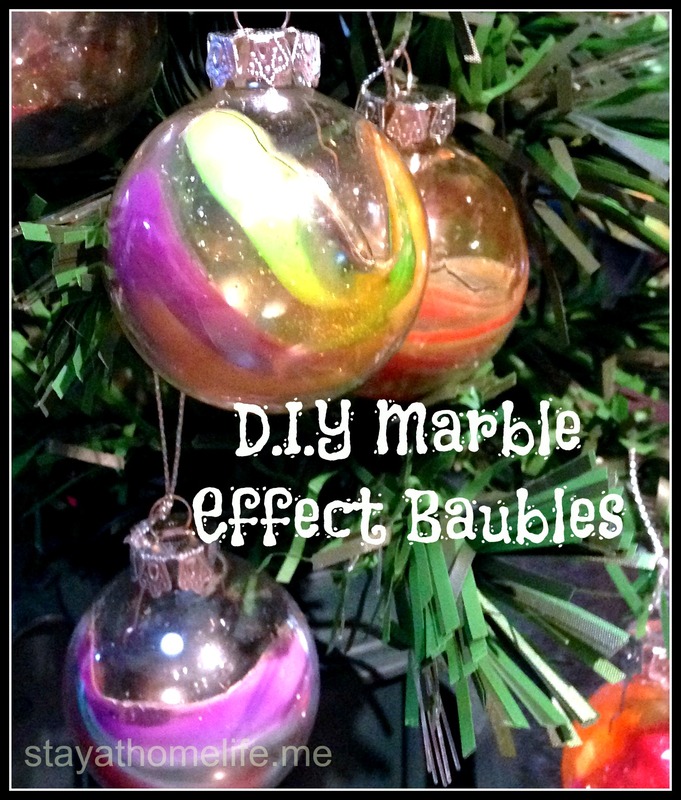 There you have it, marbled Christmas baubles. I actually started today out with the intention of making some bell tree ornaments, but the bells I had were too big. I then attempted another type of wreath and it was a big fat fail too. So after a few hours of feeling sorry for myself, I decided to make a different kind of wreath using the same principle as the bauble tree I made last year. Run your cursor over or click each image for step by step instructions. Draw or trace out the outline of the shape . I used silver card, but you could use any colour card. Something that has a little bit of flexibility, but is strong enough to support the weight of the baubles. I used hot glue to stick each bauble down. You could use PVA or craft glue, but hot glue dries really fast, which is very helpful when you are dealing with things that roll! I removed the strings and holders off each bauble, and glued them so that each top was touching the line, as a gauge. Once the outside was complete, I did the same with a row of smaller balls on the inside. 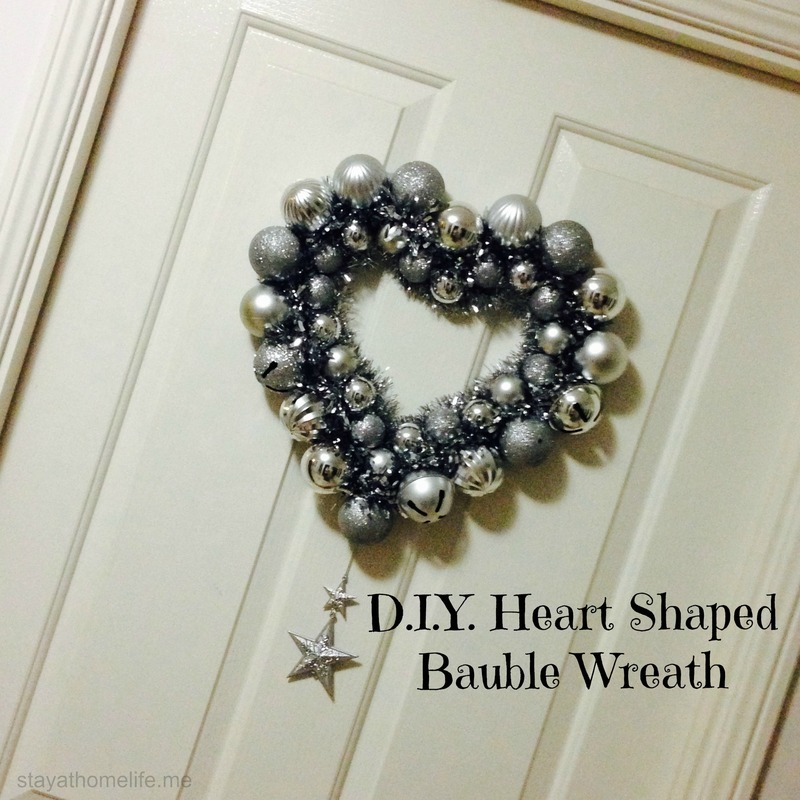 Once the glue had completely dried, carefully cut around the outside and inside of the shape, as close as you can to the baubles, but still leaving just enough card to hook any tinsel on if desired. 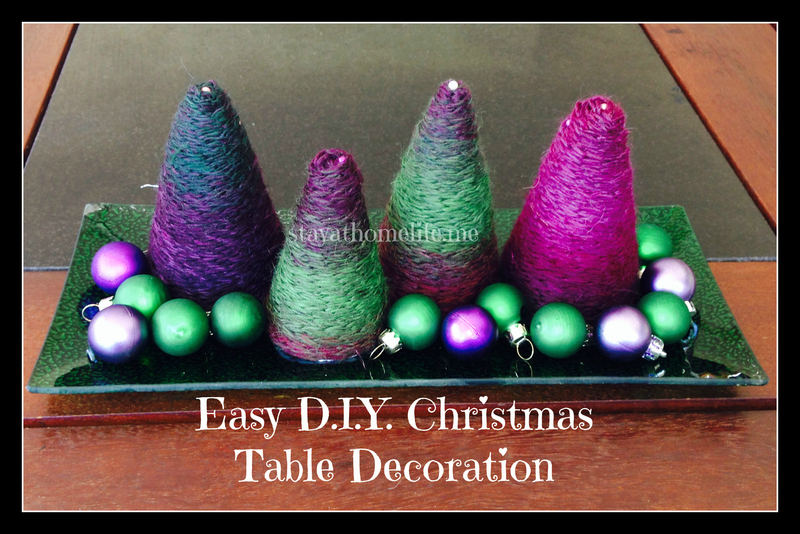 The glue is quite flexible, so you can weave the tinsel in and around each bauble easily, it will just hold in place when the baubles sit back into position. Poke some tinsel between the 2 rows to fill any gaps. I hung a start ornament from the bottom just for some extra bling and dimension. Yep, it’s that time of year again kids. I can deny it all I like, but that doesn’t help at all. I am disgustingly unprepared this year, but don’t really have the time to care, I am sure I will pull it all together in time. I do however, have time to think about some Christmas projects, YAY! So this very simple Idea should have probably taken a single afternoon, but things have been so hectic around here lately it took several afternoons over a week. It didn’t really turn out as well as I had imagined, but they are still pretty cute, and we have plenty of left over cones to make something else out of when inspiration hits me. The shaggy wool (I’m sure it has a real name) was $2 a ball. There was wayyyy more than we needed in each colour. I just used cheap spray paint, Mr 8 did the first few coats then I went back and got the bits he missed. I tried sticking on some plastic ‘diamonds’ for extra sparkle, but you can’t really see them. We all had a go at wrapping the wool into the cone, then I gave them a hair cut to tidy them up. Simple as that! This week I am excited to feature a project from a local crafty mumma from All Tizzied Up . 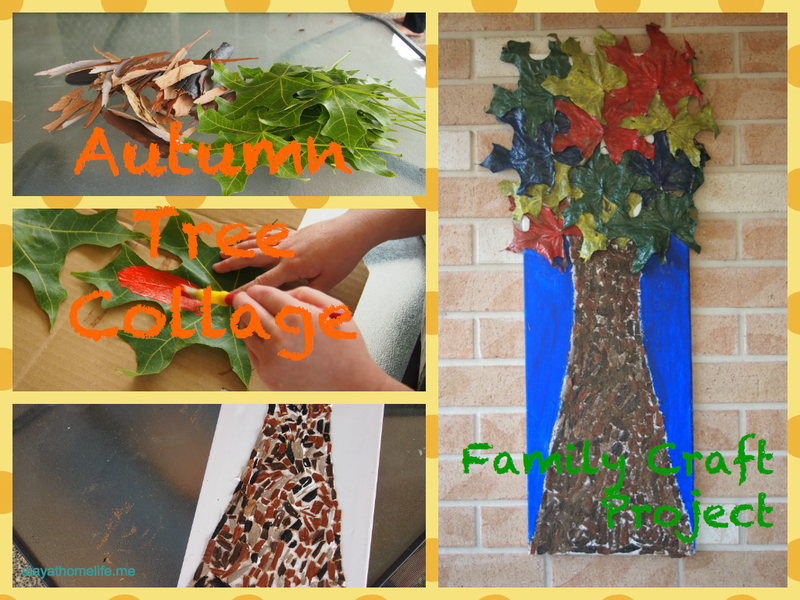 She and her gorgeous girls have brought nature and some textiles together to create a colourful fall themed wall hanging. 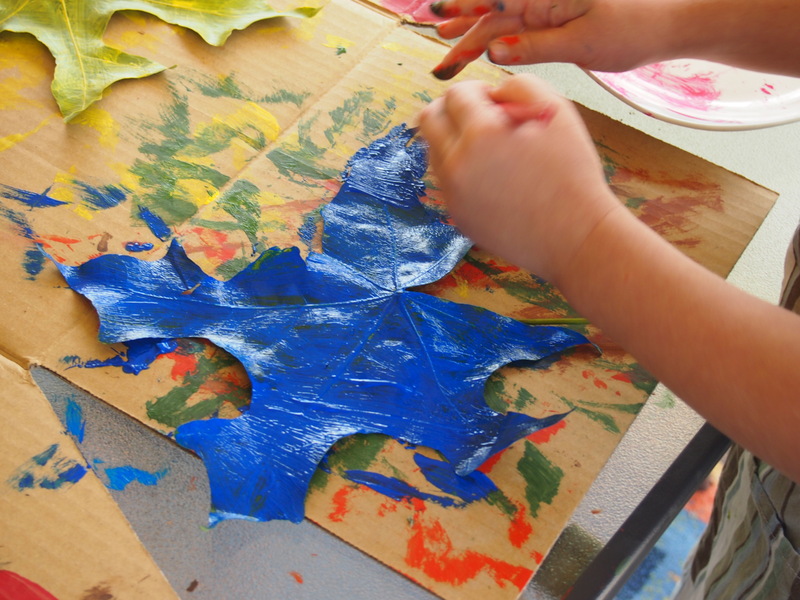 They have gathered up some bark and leaves and painted the leaves while still fresh using acrylic craft paint. The paint has slowed down the drying out process and kept them supple so they don’t crack through the next few steps. The rest if fairly self explanatory, or run your mouse over each picture for more details. Coat with another thick layer of PVA as a sealant. Once all the collage was together, mum then filled in the surrounds of the tree with blue paint and there you have it.